An affordable two-sided graphics stand offering simplicity, versatility and quick assembly (Note: custom banners sold separately through Kalamazoo Banner Works). With its anodized matte black finish, Messenger-X comes in five stock widths from 20″ – 46″ wide, telescoping from 56″ to 96″ high. The GrooveGrip™ crossbar and "Express Connect" snap-and-lock foot connection make assembly a breeze. 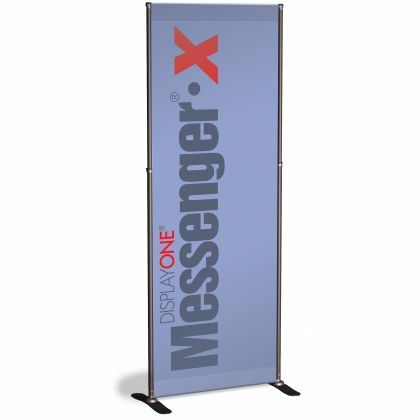 With a minimal number of parts and a minimal price, Messenger-X is ideal for single panel two-sided graphic presentations. For best presentation at special events, our LED light fixture is highly recommended. For custom digital banners to install onto your Messenger-X please contact us at info@consort.com and we'll take it from there! Remember, this stand will accommodate both one and two-sided banners. The simple & affordable display solution.